Christmas florist film is various Christmas designs available from stock. 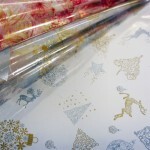 Our Christmas florist film comes in 800mm wide rolls and have 100 metres per roll. Please contact our sales team on 02476 473647 or email sales@midpac.co.uk for further information or a small sample. Christmas Film Roll800mm x 100m rollClear cellophane filmPrinted with a Santa and Snowman designIdea..
Christmas Snowman Film800mm x 50m rollsFrosted cellophane filmPrinted with a Christmas snowman desig..
Red Tinted Film RollsSold per roll800mm x 100mSolid red tinted washIdeal for florists or decoration..